I’ve never heard of this guy before, so obviously I am saying his name completely wrong. I still don’t know how to say it, because I come into the room a bit later than I expected to and so missed the important phonetic explanation bits. There are two functions going on in the hotel, and I aimlessly wander into the wrong one before 20 minutes later being embarrassedly hurried into the correct location. I skulk into the room and move to a seat a bit close to the front, trying not to feel the disapproving eyes of the people behind me. I can practically hear the questions they are asking in their heads; who’s this chick? Why is she late? Doesn’t she have a watch? Sheesh! Some people! And she’s blocking my video! I can hear all their questions and running commentary in my head because that’s exactly what goes on through my head every time someone is late to anything I’m early for. Sanctimony is a gown I don often, and always ironically. There are three people on statge; one is seated on a piano (black and resplendent, polished so clean like a crystal ball, you can see the reflection of our moods on it). Another gentleman stands with the cello that he holds close to his heart like a lover with his left hand, strumming with his right it as if trying to kill us all softly with his song. Then there is the lady on the drums; putting all of us to shame with her multitasking abilities; drumming with her hands, stepping on something with her feet and listening to the rest as well, without skipping a beat. The steel rods circumvent the playing area, and no one at the room is ready what is slowly coming together up there.With the orange dusk long gone and nature chandeliers setting the mood, we sit, marinated in our liquor, and enjoy for the best addition to a Nairobi night – Nairobi music. Soon, though, it doesn’t even really matter that I came late, because Joja Wendt – that’s his name, don’t try and say it out loud like I know you tried to, unless you’re German – is an absolute riot. He’s what I like to call a consummate performer. You know those guys? The type who can play the devil out of an instrument, and maintain a crowd’s interest at the same time, so much so that comedy is a viable second career option. The type who can thankfully be on stage and make everyone forget that you were late because they are so riveting. He has a running gag for his commentary in between each multiple set. He introduces himself in third person in some of them, because, as I will soon gather, he is very extra. Do you understand what kind of gall you have to have to introduce yourself to a room of strangers, frequently, in third person? Joja’s kind, that’s what. But his humour is so easy and self-deprecating, no one holds his grandeurs against him. He keeps mentioning that this or that has never been performed in Kenya before, and never at Safaricom International Jazz Festival – because of course, this is his first time here, and truly, nothing he has played here has ever been played before, if it is an original composition. He makes sure he tells the crowd how hard the pieces are, and how impressed they should be, as he waits for the claps. 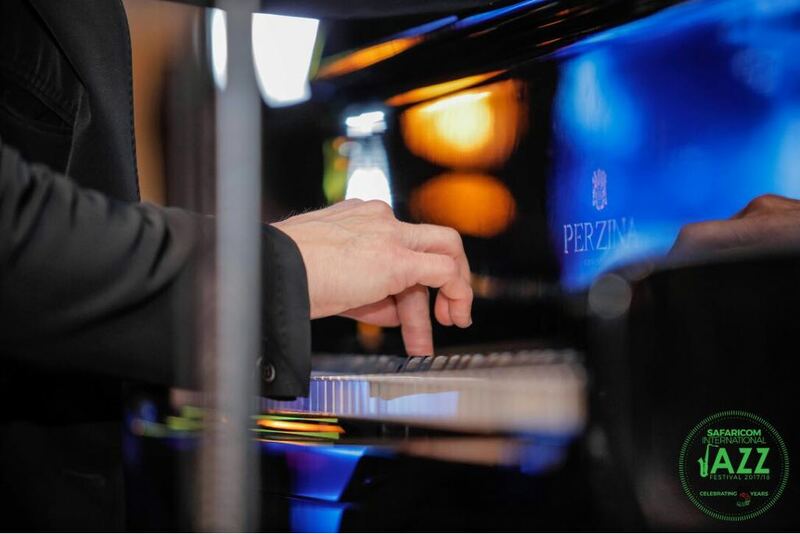 He ostentatiously throws out the tails of his coat before sitting on the piano stool, a parody of ‘very serious’ piano players who must measure the exact distance between the piano and the piano stool before they play. For a couple of pieces, he says he is playing them because he was told that they are a guarantee for a standing ovation. He’s just that type of guy. He is bringing us into his world of melody and madness, and what a world it is. Later he tells us that this is the first time he’s ever played with his drummer, Steph (that one you can say, but I’m sure I’m spelling it wrong, there’s probably a loose umlaut there or something) and I’m so surprised, because the synchrony between them is just like that between him and his bass player, Joseph, who he’s played with for 25 years, he says. At some point he plays a jazzy rendition of Flight of the Bumblebee, and I’m blown over, because anyone who has ever watched a silent cartoon probably knows that tune well – here’s a hint – it sounds like a flying bumblebee – but the spin he puts on it, pun intended, is like nothing I have ever heard before. Listening to Joja (because, you know, now we’re on a first name basis and everything) makes me think about why I like this type of music so much. Jazz, to be specific. What is it about instruments and improvisation that gets my feet moving and my heart singing, that takes me to a different time and place? This circular question makes me think about who else Safaricom Jazz has introduced me to, and that reminds me of the very first time I heard MacKinlay Mutsembi play, better known to music enthusiasts as Mac, a third of the Nairobi Horns Project. At the first Safaricom International Jazz Festival I covered, if I’m not wrong, the deft Edward Parseen and his band were playing, and I had never heard of them either. Ok, if I’m telling the truth, every time Safaricom Jazz brings in someone, I’ve never heard of them before, and by the end of that event, I love them as if I grew up with them. Like when they brought Kunle Ayo and I was completely floored by this Nigerian fireball. On a normal day, Nigerians are easily noticeable, but this guy, with his wicked skill and winding waist, was unlike any Nigerian I had ever met by then. Or the first time they brought Kirk Whalum, the guy behind the iconic Whitney Houston saxophone solo who can really take you to church when you didn’t even know you wanted to go there in the first place. It’s easy to see these guys in videos on YouTube, but when they’re right in front of you, it is surreal. And to think that there was a scene here, that was flourishing, like that! That there were people here making great music, and we had the chance to watch them open for the greats, was exhilarating, to say in the least. But I digress. Parseen was up, from Kenya, and Mac was still playing for AfroSync, representing Kenya also. Nairobi Horns Project was nothing but a dream in his head. This is mostly because Mac was trying to be a proper obedient Kenyan child, the ones who go to school and get good grades and then it is naturally assumed that they will go to university and get a worthy degree, something that the parents can be proud of at church and in chama. Something weighty, like doctor, or lawyer. Engineer. Scientist. Works in an NGO. That last one was what Mac picked – although if you see him tooting that trumpet now, you would never think that that would be his most likely profession. Before he decided that he was going to do this ‘music thing’ professionally and solely – a mere two years ago – he played at SIJF, and opened for Hugh Masekela, undoubtedly one of the greatest and most revered trumpet players in the world. Not bad for a guy whose introduction to music was playing in a Salvation Army Band, 20 years ago. Look, it just takes some people longer to decide than others, ok? 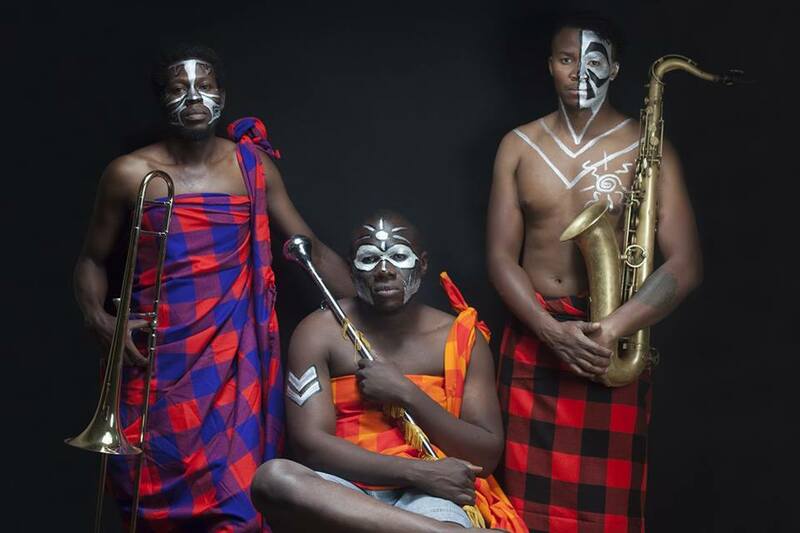 Nairobi Horns Project…or is it Wakanda Horns Project now? Back to my first time. Before the band got on stage, the crowd was milling about, confused that there was a concert in Nairobi that actually started on time, irregardless of whether there was quorum or not. I remember the band getting on stage and when they started, you could tell that this wasn’t something they did often – playing in front of hundreds of people, that is – but the psyche and energy they brought during their performance was, quite simply, electric. That’s how NHP got on my radar, and have been on it ever since. If you have ever watched a Nairobi Horns Project concert or performance, then you know what I mean when I say that these three guys really put on a show. And they’re so good at it, too – which is why they have so many gigs going on at the same time – mara SIJF, mara the Nyama Mama midweek music nights. When you’re watching them, you can tell that they enjoy what they’re doing. And their ‘supporting cast’ feeds off of their vibrance when it whips like lightning through a crowd. The crowd feels in their bones that this is the culmination of many dreams coming together for something greater than what they ever thought they could be. Which is something Mac affirms. The band has so much more that it intends on doing – albums, tours, gigs, growth. It’s going to be a musical extravaganza movement. But of course, I already knew that, particularly after I watched a crowd go crazy when NHP performed their rendition of old school Kenyan music, reworked on horns. It sounded magnificent, and it took me back to the place I was when Joja was playing as well. And that answered my question. What was the answer? That music is memory. The reason jazz gets to me most is because it is the music of my childhood, which ties up with my memories of it – right alongside Angela Chibalonza and King’s Messengers. Most Kenyan homes had a little Angela, even just one song (…jina la Yesu/imenitoa katikaaaa/mikono ya IBILISI…). My home also had musicals and cartoons – Disney, to be specific. Every soundtrack of the movies I watched was played by a wide swathe of a talented orchestra who we never saw – except for fun in The Sorcerer’s Apprentice – but we always heard. Some of my favourites movies of all time are from my childhood, and ditto for their soundtracks – Sarafina, The Lion King, My Fair Lady…just to name a few. We all threw our fists in the air when Sarafina sang – Freedom! Is coming! Tomorrow! Those were trumpets in the background, right? Then there was the Circle of Life in Lion King with the unforgettable bass line. And in My Fair Lady, all my sweet spots are too many to count. There is something about prolific instrumentalists that resonates with me on an elemental level, because that’s where my love for music was hard-wired into me, from very early on. Joja played something last night with a chord progression that could have easily been in Lady and The Tramp – the bit for the female dog in jail, the one who’s kind of a vixen in unrequited love? – , or served as the escape theme for Tom and Jerry, racing through impossible spaces and improbable routes. When Mac picks up his trumpet to drive a crowd wild with Mwanamberi, or to churn them into a frenzy with ‘BoomboomboomboomBA!’, they love it because it’s good, but also because it’s memory. Music is memory, and memory moves you.